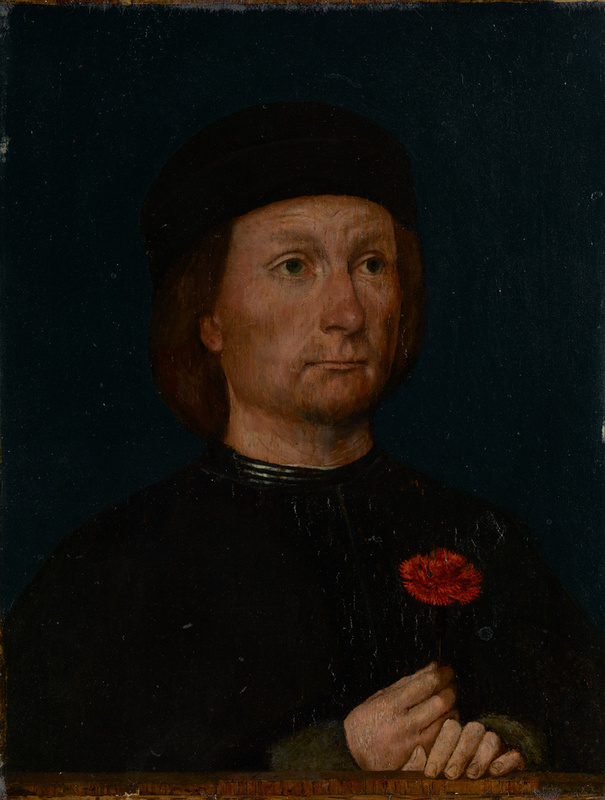 This man holds the pink very conspicuously, yet its significance in the portrait remains mysterious. The flower was originally named for its bloom shape and time of flowering, at the end of May, around Pentecost, known in the Netherlands as "Pinkster." Presumably, the petals' serrated edges were seen as resembling the tongues of flame that descended on Mary and the Apostles at Pentecost, enabling them to speak in any language, spread God's word, and build the Church. Additionally, "pinksten" meant "fiftieth" in German, and Pentecost was celebrated fifty days after Easter. The portrait has been greatly damaged, but the face and the flower display Michael Sittow's sensitivity to the effects of texture and light. To create his characteristically luminous surfaces, Sittow applied many layers of translucent paint. The sitter's projection of melancholy also typifies Sittow's portraits. Source: Letter in museum files from Lorne Campbell, September 30, 1980. Private Collection, sold to Wildenstein & Co. (London, England), 1952. Wildenstein & Co. (London) (London, England), sold to the J. Paul Getty Museum, 1969. Portraits 15th to 19th Centuries, exh. cat. (London: Wildenstein & Co., 1963), no. 11. Fredericksen, Burton B. Catalogue of the Paintings in the J. Paul Getty Museum (Malibu: J. Paul Getty Museum, 1972), p. 59-60, no. 72, ill.
Campbell, Lorne. Review of Michael Sittow: Peintre revalais de l'école brugeoise (1468-1525/1526), by Jazeps Trizna. Apollo, n.s., 105, no. 181 (March 1977), p. 225. Jaffé, David. Summary Catalogue of European Paintings in the J. Paul Getty Museum (Los Angeles: J. Paul Getty Museum, 1997), p. 118, ill.
Weniger, Matthias. Sittow, Morros, Juan de Flandes: Drei Maler aus dem Norden am Hof Isabellas der Katholischen (Kiel: Ludwig, 2011), pp. 160-61, no. N108, fig. 90. Wolfthal, Diane, and Cathy Metzger. Los Angeles Museums, Corpus of Early Netherlandish Painting (Brussels: Royal Institute for Cultural Heritage, 2014), pp. 294-303.